Get double barrel multi-GPU gaming performance that works with all games by just adding another HIS X1300 Series graphic card for powerful GPU sharing. 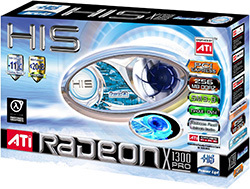 Starting with a HIS CrossFire Ready graphic card and motherboard, plugging another HIS X1300 Series graphics card. HIS CrossFireℿaccelerates all your games, all the time, and delivers the highest image quality modes and resolutions with no special software or patches needed for compatibility. The IceQ cooling system draws cool air from inside the case and exhausts warm air outwards. This prevents the fan from recycling warm air to cool the VPU, which increases cooling performance and lower the air temperature inside the case significantly. How to identify "Turbo" edition? HIS Turbo edition guarantees a dramatic range of overclockable speed on your card. All IceQ series come with both Turbo and non Turbo (standard) editions. Check for the box containing this label. It identifies this is a "Turbo" edition card and marked with the guaranteed overclocking speed in core and memory. Bought this card three years ago for about 80 dollars Australian. Has played great under Windows XP Professional, Windows Vista Home Premium, and now Windows 7 Professional. Hasn't skipped a beat, and one time I had a Molex to Floppy connector jammed in the fan, and the card ran fine without the fan spinning for almost 4 months! 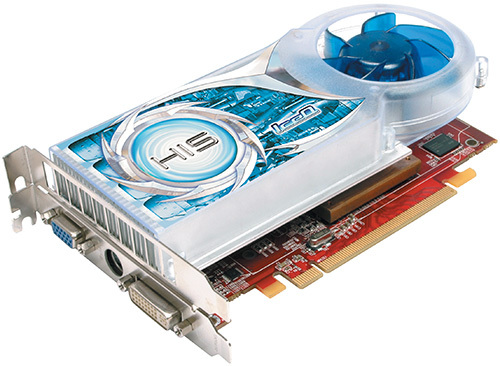 A very good card for the price, and performance to keep you happy in any operating system. [Technical Excellence] One thing that does set the card apart from other X1300 cards offered by manufacturers is the fact that you have the IceQ cooler working for you with outstanding cooling features and near silent operation.